Mom Mondays: No swimming allowed! Do you know there are some minor hockey coaches who won’t allow their players to swim in the hotel pool between tournament games? Seriously, what’s up with that? I think coaches sometimes take these tournament games a little too seriously. Nowadays, when you check into a hotel for a hockey tournament weekend, you basically have to sign in blood that your child does not have any fun whatsoever on hotel premises—no running, no playing hockey in the hallways, no shouting, no nothing. As a parent, you’re left to entertain and supervise your young hockey player, and his or her siblings, and his or her teammates (because ‘you have better snacks’) until game time. On top of that, the coach then orders, “No swimming allowed between games!” The only entertainment left is tying them to the chair in the hotel room and reading Anne of Green Gables to them. For the love of God, what am I supposed to do with them for four hours?! My kids never ran out of energy for a hockey game. And if they were uber-exhausted after swimming all afternoon and playing hockey for an hour in the evening… bonus! Hit the shower, jump into your pjs, watch a movie and close your eyezzzzzzzz. Mommy’s cracking open a bottle of chardonnay. Most minor hockey players are so jacked up on youthful exuberance they could play Marco Polo before, during and after a 60-minute tournament game without a single head bob or droopy eyelid. And I have never, EVER, seen a kid fall asleep on the hockey bench. I get it. Swimming tires out the players, making them somewhat less effective during the big tournament game. 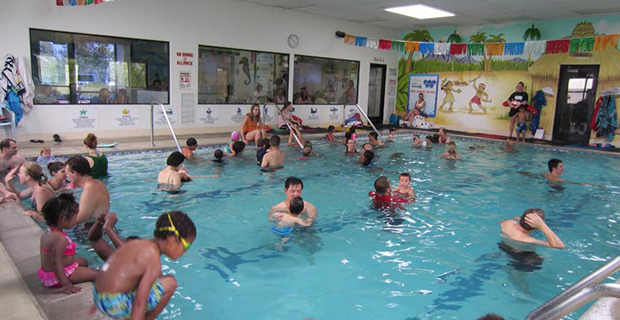 The chlorine impairs their oxygen intake levels. Your son or daughter is part of a AAA team and you’ve just dropped $750 on a weekend in Toronto (hotel, food and gas) and you want to get your money’s worth. The weekend is about hockey, not the hotel pool. Newsflash: it is about the pool! I’m certain hockey coaches all over Canada would shake their heads in disbelief over this blasphemy that is swimming between hockey games. I’m even more certain, however, that most minor hockey players remember plenty more about tournament weekends than the games. In all my years as a hockey mom, I don’t think I ever forbade my kids to swim during a hockey tournament weekend. Unless, of course, the hotel does not have a swimming pool… then by all means I nixed it. I wish the coaches would keep in mind that there are only a few precious years in minor hockey that the kids are even interested in swimming in hotel pools. By the time these players are at a level where scouts are taking a closer look, the allure of the crowded, noisy hotel pool has long-since worn off and they actually are relaxing, working out, playing Xbox, or watching movies in the hotel room—just like to coach wants them too. And somehow I am still on call for snacks. Three cheers for tournament hotels with swimming pools—and may the coach never catch you!